Unlike ordinary cigarettes, Smoke Free Electronic Cigarettes have no flame, produce no smoke, and are rechargeable. So how does it work? We use the latest, state-of-the-art technology to simulate the smoking experience in a 3 stage process. 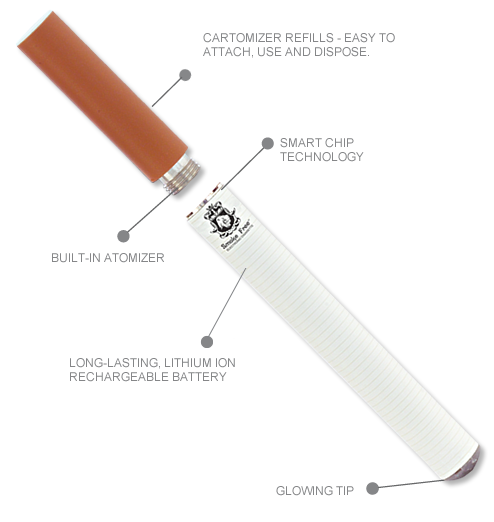 Within each Smoke Free E-Cig unit there is a self contained rechargeable lithium-ion battery and a smart chip. The smart chip "tells" the battery how much of a charge is needed to create the vapor that you enjoy so much. The atomizer takes that charge and raises the temperature of the air flow through the unit. That heated air heats the nicotine and flavored liquid within the e-Cig cartridge or cartomizer creating a vapor. When you inhale, you get pure "smoking" pleasure - either with nicotine or without. The "filter" part is a cartomizer refill - this is the part of the cigarette that contains the Nicotine. You simply attach a new cartomizer refill when needed and discard the old one. Each cartomizer has a built-in atomizer giving you maximum vapor and the fullest flavor. The longest lasting battery on the market - we guarantee it for a lifetime! And, we are the only manufacturer in the industry to offer a lifetime warranty on our battery unit and chargers. Our cartomizer and cartridge refills come in a variety of satisfying flavors. Each flavor is available in different levels of nicotine - from none (no nicotine) to high - you can be assured we have the level you desire. We offer a variety of Electronic Cigarette Kits to give you everything you need to start enjoying the freedom of electronic cigarettes. Smoke Free electronic cigarettes will keep you from being pestered by friends and relatives about your smoking habit. How much grief have you gotten about that nasty cigarette smell and smoke? With our electronic cigarettes, there is no smoke ... its vapor! You do not exhale smoke; instead you exhale vapor, so you can enjoy your E-cigs almost anywhere! 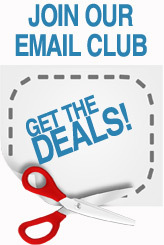 Plus E-Cigs will save you money on dry cleaning (no more cigarette stink on your clothes). No tobacco stained teeth and fingers. And besides, just maybe your wife/husband, girlfriend/boyfriend will be "in the mood" more often! E-Cigs can really improve your quality of life!